CACI International (NYSE: CACI) has agreed to acquire Herndon, Va.-based government technology contractor LGS Innovations and purchased Rochester, N.Y.-based rugged equipment manufacturer through a pair of deals worth approximately $975M combined. 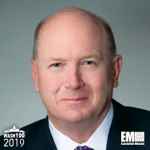 Ken Asbury, president and CEO of CACI and a 2019 Wash100 winner, said in a statement released Wednesday combining the three companies will offer advantages for defense and intelligence customers. Mastodon Design offers signals intelligence, electronic warfare and cyber technology platforms that employ a small form factor design. CACI will pay $750M to buy LGS from Madison Dearborn Partners and CoVant Management in a push to grow footprint in the command, control, communications, computers, intelligence, surveillance, reconnaissance and cyber market areas. The Arlington, Va.-based company estimates its revenue will increase by $480M over the next 12 months as a result of the two acquisitions and expects both deals to be accretive to the company’s net income and earnings per share. Gibson, Dunn & Crutcher and J.P. Morgan Securities respectively served as the legal counsel and financial adviser to CACI in the LGS transaction.